As predicted, Monday night’s Churchill Young Musician Of The Year competition 2018 was simply inspirational! The competition was intense this year as the standard was once again, extremely high. Advanced students from Churchill Academy and Sixth Form gave us an uplifting selection of assured performances. The judging panel—chaired by international violinist, Ruth Rogers (pictured 4th from the left with the winners), Alice Harper, MA Cantab (voice and violin) and Adrian Trapp MA Cantab (piano and keyboard) found it hard to choose the winner. Ruth told the competitors, “You are all winners”. She said how difficult it was to choose when the parameters are so broad. How do you compare a voice performance to a ‘cello, piano, violin or clarinet? We are delighted to announce that the panel chose Lucy Buncombe (voice) as the Churchill Young Musician of the Year 2018, (Voice). The judging panel felt that Lucy is a natural performer – her performance of Dreaming Wide Awake by Jason Robert Browning was very emotional and compelling – they were gripped. George Skeen (Violin), was the overwhelming choice for the winner of the Churchill Music Audience trophy. George gave a very accomplished performance of the first movement of Haydn’s Allegro Moderato and How-Down from Rodeo by Aeron Copland. The competition is also supported by Wrington Vale Rotary club who offer the winners the chance to compete in the regional finals of their Young Musician competition held at Kings of Wessex School. Pictured above from left top– Daniel Robinson. 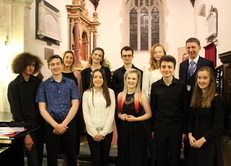 Lucy Buncombe, Ruth Rogers, chair of the adjudicating panel, George Skeen, Chloe Phipps, Head Teacher, Chris Hildrew, (bottom row George Derry (winner of the Raymond Hayter Song Prize, Ella Hutchinson, Lucy Taylor, John Skeen and Molly Sprouting. (Picture by Churchill Academy). During the interval, after the traditional Churchill Music canapés had been handed round, the Raymond Hayter Song Prize was awarded to George Derry for his ‘outstanding vocal contribution to the Music Faculty’ followed by a performance from him confirming his very promising voice. The Churchill Academy Chamber choir also entertained the audience making for a very special evening. Chris Hildrew, Headteacher rounded off the evening with a maths lesson relating music and rhythm to maths. He praised the exceptional partnership between Churchill Music and Churchill Academy and was rightly proud of all the young musicians, their teachers and parents. Thanks must go to the entire team of staff at the Music Faculty for their tireless work in nurturing these young people and helping them be the very best they can be. Don’t miss a second chance to hear these young musicians at the Young Artists Showcase at St Georges, Bristol on Tuesday March 6th at 7pm.